After our stay at the Ritz-Carlton Powerscourt, we drove down the back roads to Cahir and from there back up into County Tipperrary; where we were due to stay the night at Lismacue just outside of Bansha. I'd booked the property through Hidden Ireland and had seen some favorable reviews on Tripadvisor. The drive turns directly off of the N24 just on the southern outskirts of Bansha. It's easy to miss (we did), just keep your eyes open for the white stones marking the turnout and gates. After making our way up the lovely lime allee', we were not disappointed by our first glimpse of the property. Lismacue is a lovely old country house, dating back to 1813, that is still occupied by the original owner's family. The house has five rooms in the guest wing (pictured above), though one was under repair during our stay. We were the only guests that night and were warmly greeted by our hostess, Kate Nicholson. Well, technically, we were first greeted by our hostess' very friendly dog, Luther. Kate showed us to our room, with a double bed and a twin bed on the second floor. The room featured lovely views of the surrounding countryside and an ensuite bath. After leaving our bags in the room, we went out for a stroll around the grounds. Lismacue sits out in the fields, with a horse paddock out front and a cow pasture just beyond the ha-ha at the edge of the lawn. Around the bend in the drive is the lime allee and a quaint little stone bridge across the River Ara'. Luther, the house dog, accompanied us on our walk. Kate can provide dinner to guests if arranged in advance, and we had wisely chosen to to do. We were invited to relax in the library where drinks were served and a nice fire was burning. Dinner was quite good, and we were joined by Kate's husband, Jim Nicholson. He proved a convivial host, and we enjoyed our dinner. While we only stayed the one night, I think that Lismacue would be a good base for exploring County Tipperary and the environs. Both Cahir and Cashel are quite close by and the countryside is beautiful. UPDATE: It appears that Lismacue is no longer with Hidden Ireland. However, the house can still be booked through their website at : www.lismacue.com. Interestingly, the entire house is also bookable through Airbnb. Those who are involved in this hobby tend to have a particular frame of mind. We like rules. That is to say, we like figuring out what rules mean. Sometimes digging into the rules, or Ts&Cs, of an offer/promotion can turn something that's interesting on its face into something that's actually very interesting. Below is one example. Starwood is auctioning a chance for the top three bidders the chance to audition to sing the National Anthem before a Cubs game. The Cubs will select one of them to sing the Anthem. That would definitely be a once-in-a-lifetime experience. But that's not what makes this auction so interesting. What makes it interesting is what the Ts&Cs say about the two bidders who lose the auction. They get their points back and they get a pair of luxury box tickets for later in the season. Do you see what immediately leaped out at me? Of course you do. 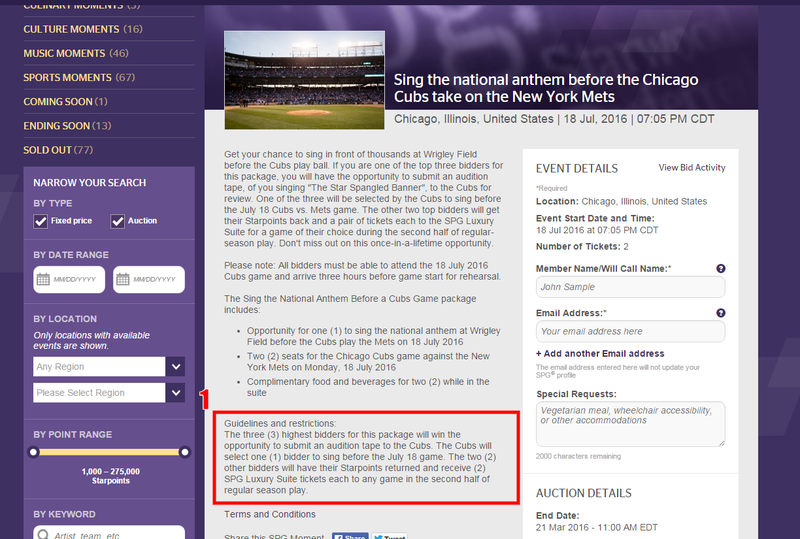 If you wanted luxury box tickets but didn't want to sing The Star Spangled Banner in front of thousands of people, you could try to win the auction and then try to lose the audition. Just submit a terrible audition and ... Bang. Free luxury box tickets. Here are some pointers. One small problem, though. You might be facing a quasi-prisoner's dilemma situation where all three of the top bidders are trying to lose the audition. If that happened, I would really love to be in the Cubs offices when those tapes come in. UPDATE: As the auction nears it's close, bidding is up to over 100,000 Starpoints. I'll admit I threw in a couple of bids early on, but to me, a one third chance of getting to (or having to) sing the Star Spangled Banner in front of a crowd isn't worth the points! UPDATE: Auction closed with the top bid at 205,000 points! Wow! That's the equivalent of two first class tickets to Europe. ETA: Bids keep getting updated. Now its up over 220K points. That's just nuts. Many bloggers, including those on my sidebar, focus on really exotic travel (Maldives, Far East, Oceania, etc. ), but my tastes are more prosaic. Mrs. Points Ninja and I prefer Europe, as, at a guess, most casual travelers do. Since getting into the miles & points game, we've traveled to Europe four times, each time in either First or Business class, and each time using miles. Over the years, I've built up quite healthy miles balances and currently have enough for at least four more transatlantic (TATL) trips. But, as a though experiment, this post will lay out a strategy for achieving a reasonable travel goal: one business class tickets to Europe. Of course, a couple could use this same strategy to earn enough miles for two tickets. How to do it? Well, if you're an actual frequent flier, congratulations! You may already have the 100,000-125,000 miles that a business class ticket will cost you. For the rest of us, the answer is credit card sign up bonuses. Caveat: No one should consider this strategy if they plan to carry credit card debt, i.e. not paying your bill off in full each month. If you have credit card debt, my best advice would be to work at paying it off first. With that out of the way, let's look at possible strategies. For the purposes of this post, I'll assume that the reader has 0 miles. I'll try to get you to 125,000 miles in a program with decent TATL availability with the minimum number of credit card sign ups (and credit report pulls) as possible. Starwood American Express: Currently Amex is offering 35,000 miles when you sign up for the Starwood Amex and spend $3,000 in the first 3 months. The card carries a $95 annual fee, but it is waived the first year. Cancel before you're first year is up and you'll pay no annual fee. The nice thing about Starwood is that their points transfer to multiple airlines (including Delta) and you receive a bonus of 5,000 miles for every 20,000 miles you transfer. Links for this offer can be found on Amex's home page or in any of the blogs on my sidebar. OR, you could let me refer you and I'd earn a bonus when you signed up. If you're interested, just email me at: thepointsninja@gmail.com. Starwood Small Business Amex: Essentially, this is the same offer as above, but for small businesses. "But I don't have a small business" you say. To that, I ask, have you ever sold anything on Ebay? Then you have a small business. Amex regularly approves small business applications for sole proprietor small businesses like this. Lucky @ One Mile at a Time covers the card here. Delta Gold Amex: Get the two cards mentioned above first (you can apply for both on the same day). Then wait a couple of months and pick up the Delta Gold Amex. The current offer is 30,000 Skymiles for getting the card and spending $1,000 in the first 3 months. You'll also receive a $50 statement credit for your first $50 Delta purchase (which can be a $50 Delta Gift card). There's on annual fee the first year, and you can cancel the card when the fee comes due in a year. I can refer you to this offer, but there are occasionally better offers available. If one comes up, I'll update this post. EDIT: The Frequent Miler offers useful info on looking for targeted (i.e., better) Amex offers HERE. After completing the required initial spending (see my posts on Manufactured Spending for tips on how to do that) you'll have 76,000 Starpoints and 31,000 Skymiles. And additional $4,000 in spending on either Starwood card would bring you up to a round 80,000 Starpoints which could be transferred into 100,000 Skymiles, bringing you to a total of 131,000 Skymiles. Your total costs would be (at most) the cost of manufacturing $11,000 in spending, approximately $128. Not bad for a TATL business class ticket. Ouch! Over $1,000. So, this isn't the best option for travel on the cheap. I'll try to help you deal with those taxes, though. British Airways Visa: This one's issued by Chase and has a great sign up offer discussed here by View from the Wing. If you're willing to do some manufactured spending (or can put $20,000 in regular spending in the first year you have the card) you'd earn a total bonus of 100,000 Avios. Bump your spending up to $25,000 and you'd have enough miles to cover a TATL business class ticket. Bump it up to $30,00 in the first year and you'd qualify for a "travel together" award allowing two people to travel in business class for 125,000 miles (BUT, you pay taxes on both!). Again, I can refer you to this card, or you can find a public offer on Barclaycard.com. If you used your Arrival card to pay the taxes on your BA award, those 40,000 Arrival points would be good for $400 towards your taxes, bringing you down to about $700. Still not great, but much cheaper than paying for a business class ticket, or even an economy ticket for that matter. If you can find availability, American's Saver-level business class flights cost 100,000 AA miles. Flight's on AA's own aircraft don't carry excessive fees, but watch out for the BA flights that will appear in online award search results. Those will carry the same high fees that I discussed above. But, at least getting to 100K miles with AA is pretty easy. Citibank Platinum Select AA Mastercard - This card carries a $95 annual fee (waived the first year)) and comes with a 50,000 mile bonus for getting the card and spending $3,000 in the first three months. The Frequent Miler discusses this offer, and others here, and his referral link is here. Citibank Business AA Mastercard - This is another small business credit card that offers a 50,000 sign-up bonus for spending $3,000 in the first three months. Like the personal card, the $95 annual fee is waived the first year. The Frequent Miler discusses this offer, and others here, and his referral link is here. Alternatively, you could get the two Amex Starwood cards discussed in the Delta section of this post. Starwood points transfer to AA also, and taking this route would earn a total of 100,000 AA points once you include Starwood's transfer bonus. In the near future, I'll be updating this post to add options for Lufthansa, and United, so stay tuned!